It started innocently enough - a beautiful Instagram picture post; a simple comment; the helpful reply; and then the private emails began. Pretty soon, I was logging into Paypal and breaking my golden rule about not buying from outside Canada! Oh, but that Instagram picture showing a brown leather pencil case was gorgeous. And, based on those friendly emails, I could get one custom made to fit full-length Blackwing pencils with pencil guards! And this leather pencil case would be a nice complement to my leather Pilot Pensemble pen roll that I use for my EDC fountain pens. I, like Steinbeck, don’t like short pencils. If they don’t rest comfortably in my hand, they usually get recycled. That means that my pencil case always carries several almost-new pencils, and I cap the points to avoid breakage as I have limited useful pencil life in a length I am comfortable. A fresh Blackwing, my favourite pencil, with a Palomino pencil cap is 9” long, whereas most leather pencil cases are only between 7.5 to 8” long. 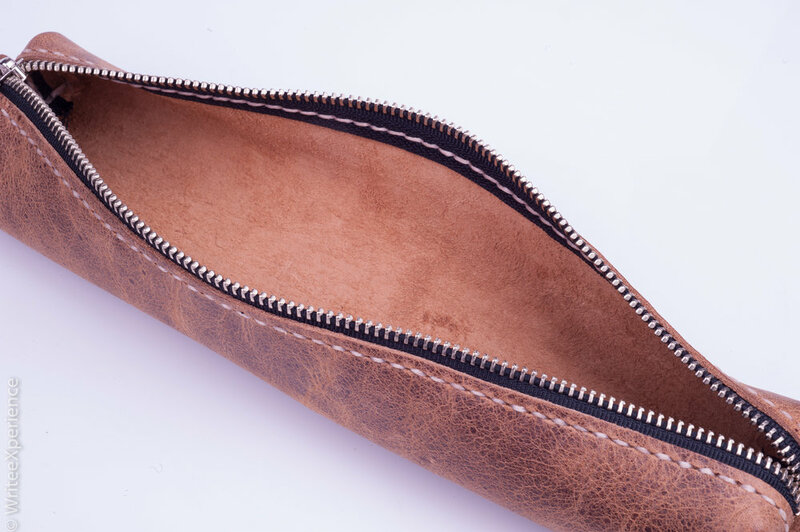 Makers South, a hand-made leather goods fabricator from Huntsville, Alabama, produces some beautiful looking leather goods, including a standard length pencil case. I reached out to them after a positive Instagram comment, explaining my need for a longer case, and they offered to make a custom length case for me in the same design as the picture that I saw online. I had never bought from them before, or even seen their work in person, but after the nice email exchange, which gave me pricing including shipping to Canada, I purchased the item and sent money to them. And waited! Makers South made the case on their promised schedule (only one week) and was kind enough to send me a Paypal shipment notification. A couple of weeks later, I was anxiously checking my mailbox every day after work. And checking…. and checking. Finally, the dreaded white Canada Post delivery slip came instead of the pencil case. Canada Customs had identified the shipment for additional tax collection and charges. $17 and almost three weeks later and I finally had the package in my hands! I couldn’t wait to get home to open the padded envelope. The first thing I noticed is how gorgeous the medium-soft leather is. The tan-brown leather has a nice texture with prominent grain detail. The leather has lots of character and still appears quite durable, just like the photo of the original case. The build quality is very high, with all seams fitting together tightly and with perfect stitching. 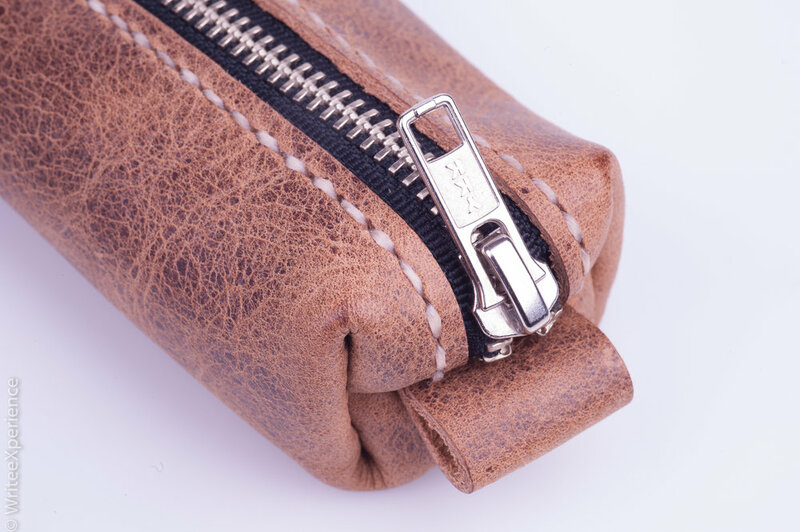 A quality YKK zipper is installed along the top and extends down to the ends - allowing a top opening with access to the full length of the case. The excellent access is a great useful touch. 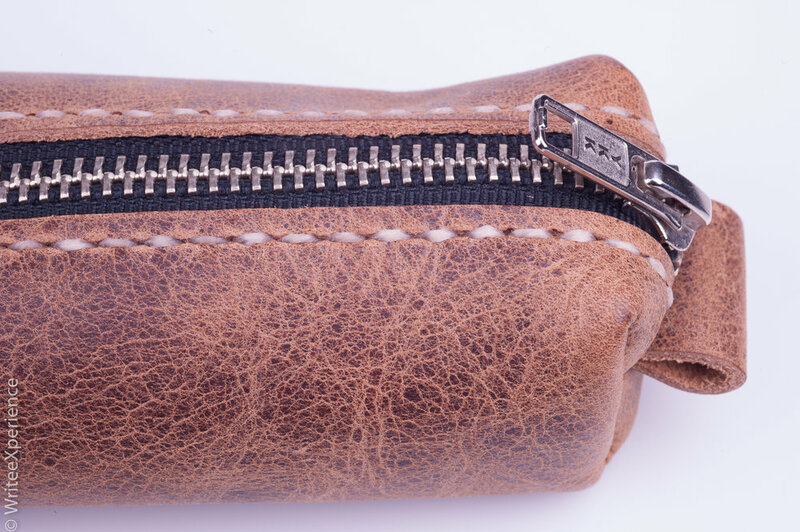 The ends have a small loop which one can hold to open or close the zipper. Makers South finish the inside nicely, and the design avoids any strange interior seams that could trap or damage the contents. The non-lined interior is quite soft, and I don’t worry about any harm to my pencils. My pencil case is quite long - coming in at 11”. This case was a requested custom length and is perfect for me. Maker’s South also make a traditional length case in the same design in case this would be too long for you. The rest of the case is about 2.5” in both diameter and height. 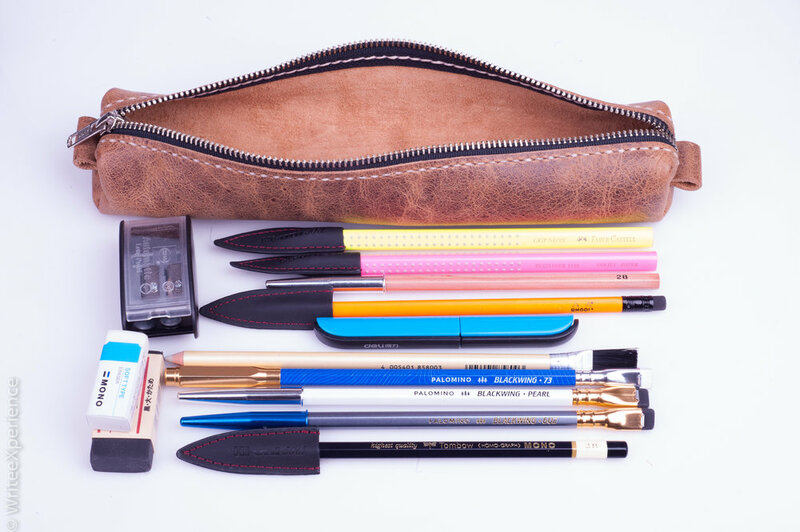 Not too big, or too small, this case carries just the right amount of daily carry stationery for a pencil enthusiast, as you can see in the picture. I can easily fit nine pencils, a Palomino Long Point pencil sharpener, two erasers and a set of folding scissors in this case. I recommend Makers South pencil cases. The case is perfect, and I appreciate them making a one-off custom length case for me. The quality and design are both excellent. And the purchase value is very good for the quality of the product. I am thrilled with this pencil case! I also really enjoyed supporting a small maker who was willing to listen to customers odd and specific requests and be so accommodating. Purchasing from them was a great experience. The only downside I had to the experience was the additional and unexpected costs added by the Canadian border. The extra cost is not any fault of the maker, but one of the challenges of living in Canada and part of the reason that I started this blog in the first place. I have found no similar or comparable product in Canada. If you budget for the extra costs, you won’t be disappointed with the final price.